VAC E36 M3 Coolant Expansion Tank, Aluminum, Direct OE Replacement. Features factory fit and Sight Glass. Made of aluminum, this is the last coolant tank you will need to buy. 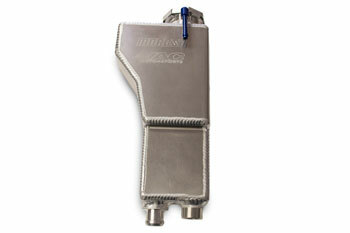 Perfect for race cars, and others that see consistent high temps, or just to look cool under the hood. Since most E36 M3s have many years behind them and many ahead, the plastic, factory coolant expansion tank becomes brittle with all of the heating and cooling cycles in addition to just being plastic and several years old. When you add the coolant pressures created by the motor, when the factory, plastic coolant expansion tank fails, it is usually catastrophic, not just 'a little leak'! This revision is a direct replacement for the stock E36 M3 coolant expanstion tanks and it does not use the factory sensor. Because of this you will need to short the wires to prevent the "Check Coolant" light on your instrument panel.